Mention any salad that has spinach as one of its main ingredients and people will usually immediately associate it with words such as boring and bland. However, orzo spinach salad is quite different and not only tastes delicious but can be made in just over an hour and is healthy. First take a large pan and fill with water that has had a pinch of salt added to it. Bring this water to the boil before adding your orzo pasta and cooking for approximately 11 minutes. 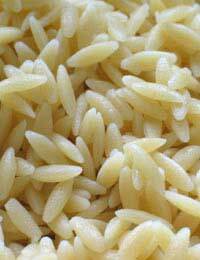 Once you have done this remove the orzo pasta from the water and remove all excess water before rinsing the orzo pasta under a cold running tap. Next take the orzo pasta and place in a large bowl where you can mix in pine nuts, white pepper, feta, spinach, basil and onion. Once you have completed this stage combine the ingredients with balsamic vinegar and olive oil before placing in the fridge for between 45 minutes and an hour. Using all or some of these ingredients will help make your orzo spinach salad stand out from the crowd and allow you to alter it to suit your personal preferences. If you prefer you may toast the pine nuts until they take on a light brown colour. You can also puree half the spinach, roughly chopping the other half, before mixing both halves of the spinach in a large bowl with the cooked orzo and olive oil. It is important to ensure that the orzo pasta is well covered with the spinach puree. Once you have done this mix in the remaining ingredients. Next take the balsamic vinegar, dried basil, red wine vinegar, dried tarragon and mustard and place in a small jar, ensuring that the jar has a secure lid. You then give the jar a good shake, which should ensure that the contents combine well together. Once combined pour the contents of the jar over the orzo spinach and mix well together. Then place in the fridge for between 45 minutes and an hour. Your orzo spinach salad is now ready for serving.